YouTube’s dominance of the worldwide video market is under threat as Facebook continues to ramp up its charge to increase its share of the lucrative online video market. In recent months Facebook began seeding autoplay videos into the News Feed, shortly followed by premium autoplay video ads; the company has increased its mentions of the importance of video in its quarterly earnings and investor calls; and it is reportedly actively trying to poach YouTube stars to create content made specifically for its platform. The results of energized video strategy are plain to see. 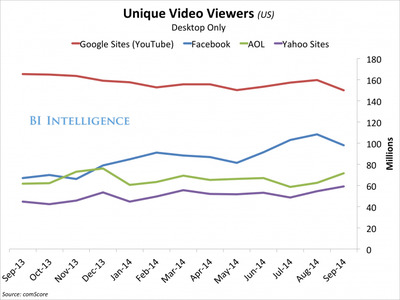 Facebook’s key metrics when it comes to video are on the up, while YouTube’s are on the wane. For the last decade YouTube has had a virtual monopoly over online video views — “YouTube” is almost as much of a verb to video as “Google” is to search — but soon it could be in the middle of an existential crisis. This isn’t just a niche specialist video app with the potential to carve off 5% or so of users, this is Facebook, which already has 1.35 billion monthly active users at its disposal to tempt away from YouTube when it comes to their video needs. Data provided to Business Insider from researchers at comScore shows how Facebook has been eating into Google’s (read: YouTube’s) market share when it comes to desktop video views in recent months. 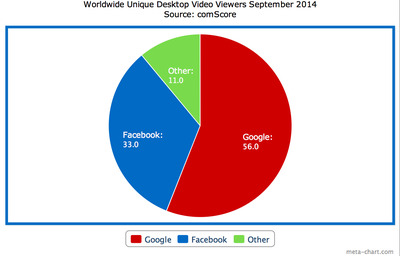 Desktop video views on Facebook grew 38.5% year on year to 491 million in September 2014. 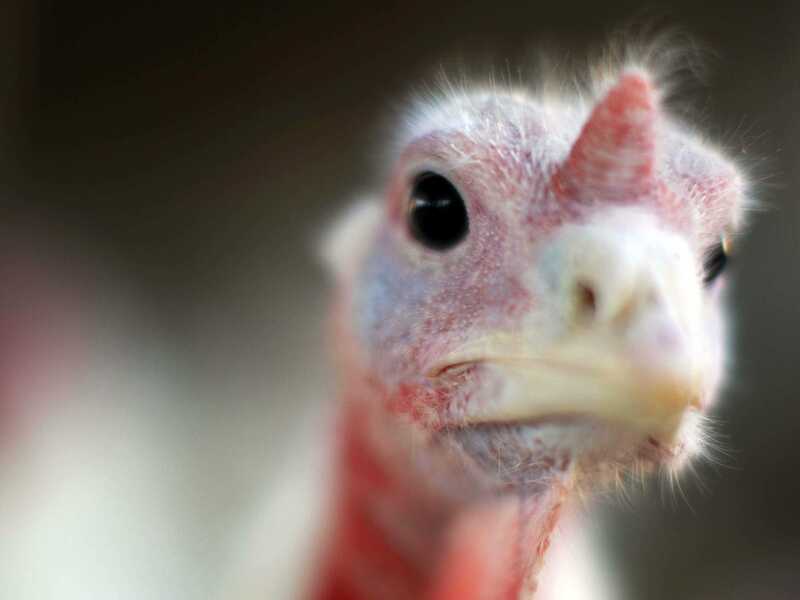 Views across Google’s sites were up 4.8% to 831 million. YouTube is still dominant, but Facebook is savagely nipping at its heels. Facebook isn’t just challenging YouTube for its video crown, it’s eating into the market share of other video sites like AOL, Yahoo, Vidible.tv and Vevo too. This is how the market looked in September 2013. And this is how it looked in September 2014. 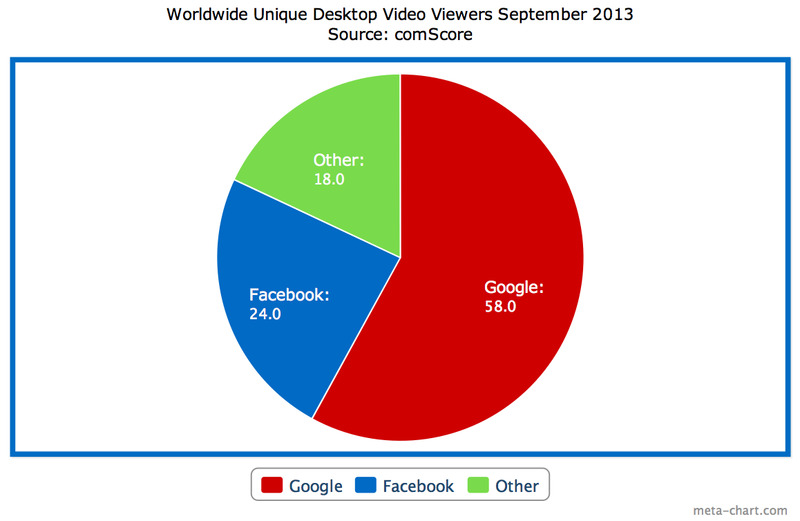 The growth of Facebook in the video space has knocked out a small chunk of YouTube’s audience and it has a taken a larger bite of the other video sites too. The situation for Google is particularly stark in the US. YouTube’s unique video viewers on desktop on are on the decline, whilst the general trend for competitors (apart from a couple of month on month dips) is upwards. 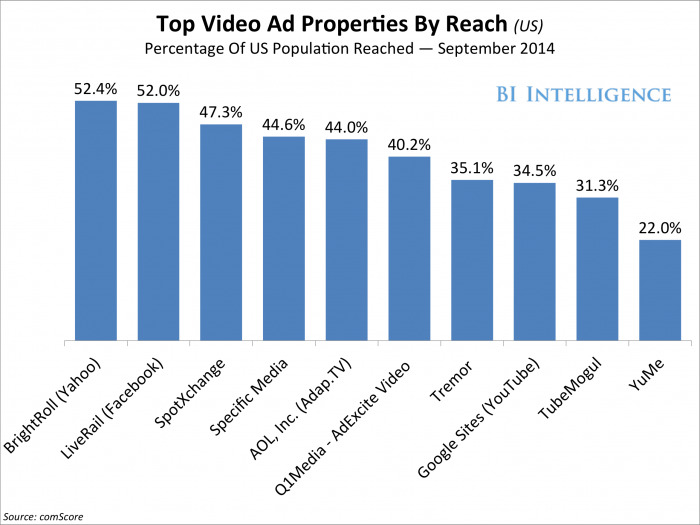 YouTube also trails far behind in the US when it comes to the reach of its video advertising. The launch of the latest John Lewis Christmas advert — a landmark advertising event each year in the UK — last week provides another pertinent example that Facebook’s video strategy is severely hurting YouTube. Facebook’s meteoric video rise could well be down to the fact that many videos on the social network start playing automatically (and are still counted as a view.) So it could be argued its video views are on the up because users have no control over when videos start playing, whereas YouTube users need to click a link or a play button before a view is registered. But in the John Lewis example, Facebook also dominated YouTube in terms of social media shares within the first 24 hours of the upload (76.9% of shares to YouTube’s 23.1%.) Shares a really important metric for marketers because they are a sign of endorsement, rather than just a sign that someone may have passively watched something without really paying attention. Facebook makes that easy to do within the platform itself, whereas you can’t share a YouTube video within YouTube. YouTube may well be hoping the beta launch of its highly anticipated ad-free subscription music service will draw people back to the platform by giving users new ways to consume its content (such as the music player that runs in the background.) It also continues to make huge multi-million dollar investments in its original content makers and advertising pushes behind them to improve the perceptions consumers have of the brand as a platform for quality content. 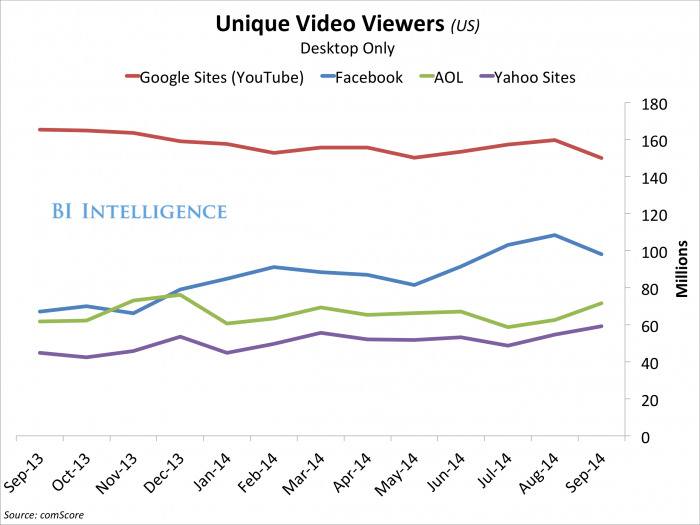 But in the background, Facebook is becoming a ever-growing threat to YouTube’s video crown.